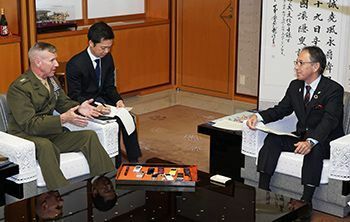 Okinawa Governor Denny Tamaki (right) meeting with Okinawa Area Coordinator Lt. Gen. Eric Smith (left). January 23, Okinawa Prefectural Office in Naha. Okinawa Governor Denny Tamaki held his first meeting with the U.S. military’s top commander in Okinawa, Okinawa Area Coordinator Lieutenant General Eric Smith. Tamaki also protested about repeated incidents involving U.S. military aircraft such as the part dropped form a U.S. helicopter onto the grounds of Futenma Dai-ni Elementary school, were, “trapping many Okinawan residents in a state of fear,” and demanded that a notification system be established in the case of an incident or accident involving the U.S. military.